It’s a glossy, globe-trotting thriller – so expect some of our favourite London locations to take their place alongside the exotic and glamorous. The contemporary John Le Carre adaptation The Night Manager is coming to BBC One on February 21st as a six-part series. The production used Morocco to depict Turkey and Egypt, Mallorca for the Mediterranean countries and the USA, Devon as Cornwall, and London as itself as well as an interior of the Zermatt hotel. In a modernising twist, the Burr character is a woman, played by Olivia Colman. 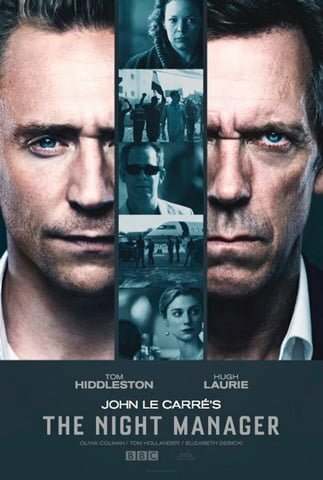 Tom Hiddleston plays Jonathan Pine, the night manager, and Hugh Laurie is Richard Roper. Le Carre himself has a cameo part. In London, the production filmed interiors at the old Central St Martins building and Victoria House in Bloomsbury, Camden. In Southwark, interiors were shot in Pageant Crescent and the Blue Fin Building. You’ll see characters walking along Pageant Crescent at night and into the house. And a character approaches Southwark’s Cathedral Square, sitting down on a bench by a colleague. Characters also chat on Riverside Walk in Lambeth, in front of the real MI6 building. And a black taxi whizzes around Lambeth streets, crossing Waterloo Bridge. Hotel night manager Jonathan Pine is recruited by a government agent to infiltrate the world of an arms dealer. With help from mysterious intelligence agent Burr, Pine has to sabotage a weapons deal that threatens the US and UK. FilmFixer helped with locations on behalf of Southwark, Lambeth and Camden Councils. FilmFixer director Karen Everett says, “It wouldn’t be a spy thriller without some impressive London shots – and once again our capital delivers.